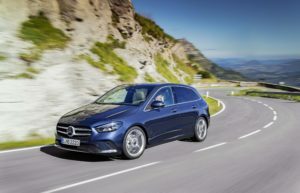 The Mercedes-Benz B-Class is now available to order, with prices starting from £26,975 for the B 180 Sport. Diesels start with the B 200 d Sport at £29,625, while the B 220 d AMG Line costs £32,375. The B 200 d and B 220 d use the OM654q engine, which has been tested to new RDE-2 emissions standards. The B 180 and B 200 both use a 1.3-litre petrol engine. The B 200 d and B 220 d feature a 2.0-litre diesel engine – codenamed OM654q. The B 200 d has an output of 146 bhp and 236 ft lb of torque, while the B 220 d generates 185 bhp and 295 ft lb. Both engines can deliver a combined fuel consumption of 64.2 mpg. The B 200 d emits 115 g/km of CO2, while the B 220 d emits 116 g/km of CO2. The optional Executive equipment line can be added for £1,395 and includes a 10.25-inch media display; Parking package including Active Parking Assist with PARKTRONIC and front and rear parking sensors; heated front seats; and mirror package which includes electrically folding exterior mirrors and automatically-dimming driver’s side mirror and rear view mirror. The £2,259 Premium package adds a 10.25-inch instrument cluster; ambient lighting with a choice of 64 colours; illuminated door sills; Keyless-Entry; and a mid-range sound system. For £3,459 customers can opt for the Premium Plus equipment line which, in addition to the Executive and Premium equipment lines, adds electrically-adjustable front memory seats; Multibeam LED headlights with Adaptive Highbeam Assist Plus; and a panoramic glass sunroof. The Driving Assistance package is available for £1,695 – only in conjunction with the Executive, Premium or Premium Plus lines – and comprises Active Blind Spot Assist; Active Braking Assist with cross-traffic function; Active Distance Assist DISTRONIC; Active Emergency Stop Assist; Active Lane-change Assist; Active Speed Limit Assist; Active Steering Asist; Evasive Steering Assist; Pre-Safe Plus; and route-based speed adjustment. The £495 Advanced Navigation package can be added, only in conjunction with the Executive, Premium or Premium Plus lines, and includes MBUX augmented reality for navigation and traffic sign assist.